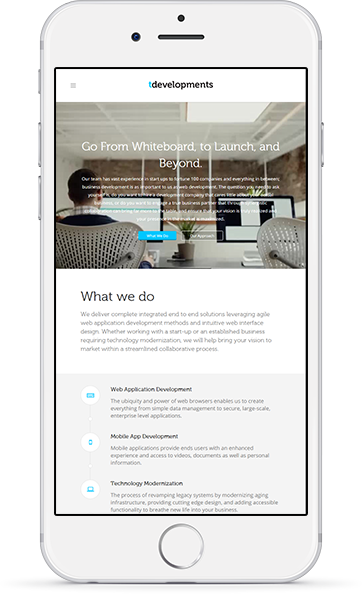 Go From Whiteboard, to Launch, and Beyond! Our team has vast experience working with startups to fortune 500 companies and everything in between. Business development is as important to us as web development. Engage a true business partner that through synergistic collaboration can bring far more to the table, and ensure that your vision is truly realized and your presence in the market is maximized. Ready to talk to an expert about your project? We deliver complete integrated end to end solutions leveraging agile web development methods, material user interface design and intuitive web design. Whether working with a startup or an established business requiring technology modernization, phoenix web design or phoenix web development we will help bring your vision to market within a streamlined collaborative process. The ubiquity and power of web browsers enables us to create everything from simple data management to secure, large-scale, enterprise level applications. Mobile applications provide ends users with an enhanced experience and access to videos, documents as well as personal information. The process of revamping legacy systems by modernizing aging infrastructure, providing cutting edge design, and adding accessible functionality to breathe new life into your business. Web Design experts create responsive, interactive layouts that increase conversions and provide a uniform experience across multiple devices. UI Designers create innovative, user-centered designs that solve problems and create efficiency by simplifying the user's interaction. UX Designers use the power of empathy, emotion and their understanding of how humans interact different types of applications to improve processes and overall, the way end users feel about an application. Let’s face the facts – In today’s world consumers are quick to research companies and their competitor’s online way before they decide on anything. That goes for inquiring about a service, purchasing a product online, deciding where to eat or where to shop. Since everyone seems to be an expert at evaluating a company (and their competitors) using various tools such as Google, Yelp, Facebook, Twitter, etc. chances are you only have one shot to impress them. First impressions are everything, after all you only get one. When your company doesn’t have a website that will impress a consumer at first glance or offer a service accessible online your business with surely suffer. It’s not just about putting your best face forward, it’s also about ease of use. Our web design and web development experts can guarantee you’re at the top of the list when these “expert researchers” (aka consumers) are making their decisions in secrecy. We’ve been building up and refining the way companies looks online since way back when, 2001 to be exact. Back when the internet was just outgrowing its infancy stage. As one of few Arizona based web development and web design companies with over 15 years of experience designing websites and developing web applications for established businesses and startups, you can rest assured that we know what we’re doing and we aren’t going anywhere. We’ve worked with hundreds of businesses based in Phoenix Arizona and service many more across the nation (Los Angeles, San Francisco, Dallas, New York, and Washington D.C. to name a few). Over the years we’ve established many long term relationships with various clients and other phoenix web development companies and are often referred to as the best phoenix web design agency in arizona. We offer a variety of complimentary services such as internet marketing (also referred to as search engine optimization), user interface design, user experience design, software development and business development services. We also LOVE working with technology based startups and are the first web development company in phoenix offering a startup development service. We know all about the specific challenges faced when launching a web based company, and also how to overcome those challenges. Our startup development service aims to turn entrepreneurs’ ideas into execution and help refine ideas and build web applications that impress investors and please consumers. Check out our portfolio or research a couple startups we’ve been involved in like Picmonic or CE Zoom, both revolutionizing web based services, both examples of how we can make you successful. That's right, we've been doing web development in phoenix for over 14 years and have a record of success. Over the years we've satisfied the web design needs of over 500 clients and counting. We're responsible for launching of over 90 new mobile and web applications. Espresso and web development - a match made in heaven. We practice latte art daily. We're a group of strategic creative developers, programmers and online marketers making scale-able web applications that engage users and promote growth.